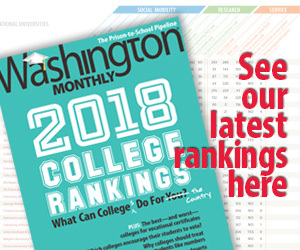 Washington Monthly | Why Are We Giving Federal Money to Private Colleges Anyway? Why Are We Giving Federal Money to Private Colleges Anyway? Over the last few years, as activists have bemoaned the cost of college and pundits, and even presidential candidates, have started to worry about college debt, a common solution proposed to this is to focus on public colleges. They are, after all, the institutions that exist specifically to be affordable for working people. The “greatest challenge facing public universities,” King Alexander explains, is that states today spend about half as much on higher education on a per capita income basis as they did in 1981. This is a direct result, he says, of a regulatory failure built into federal law. In other areas of federal policy… federal dollars come with strings attached….. That’s not the case for higher education, where money follows the student to private and public colleges alike, and states have no requirements to fund public universities at a certain (or indeed any) level. The result is that when states are under budget pressure, as they have been in the years since the financial crisis, they slash spending on higher ed. The burden of those cuts then gets shifted to students, in the form of higher tuition, and to the federal government, in greater spending on grants, tax credits, and subsidized student loans. He’s right about this, of course, but it’s not necessarily a design flaw. Federal funding is provided to universities to help individual students attend college, and to fund research. But perhaps the outcome has become troublesome. He can’t understand why the federal government gives out money to private institutions, no questions asked. Public colleges, he notes, are held accountable at least by their state legislatures for how much they spend and charge in tuition and fees. Private colleges can charge more in tuition and force their graduates to take out loans to pay for it with no repercussions from the federal government…. Of course, public and private is a meaningless distinction as far as federal funding goes. They’re not public because they get money from the government in Washington; they’re public because they get money from state governments, as they’ve done as long as they’ve been around. Federal money has never had anything to do with whether or not they were supported by state taxpayers. But he’s got an interesting idea. We might actually be able to keep college costs down, really meaningfully, if we didn’t allow federal funds in private universities at all. If federal education money had stringent rules (like in terms of limits about how much students and families could be required pay for education), and couldn’t go to private colleges, that would both leave more money for publics and encourage better spending behavior. Many low-endowment private colleges would suffer, yes, but we have no national policy commitment to the success of these schools (and around 75 percent of college students attend public institutions anyway); let them close if they can’t survive without federal money. He argues that the country made a huge mistake in the early days of Pell by granting money to private colleges at all. (His ideas about why private colleges get federal money at all is sort of interesting. 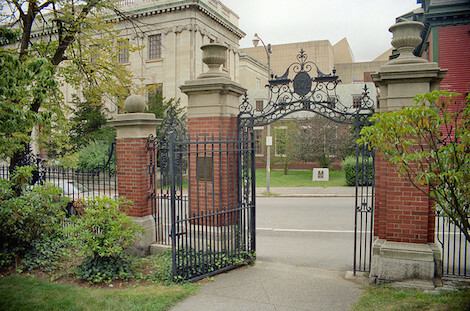 Pell grants, money for low income students to attend college, were the creation of U.S. Sen. Claiborne Pell, who went to Princeton; naturally he thought private universities were good things worthy of support.) And the solution lies in just cutting them off. It might be about time. This current system, in which tuition is escalating to very difficult places, is unacceptable, is clearly ripe for change. King outlined his vision for how this could work. States have been cutting budgets and increasing tuition at public universities faster than Congress can authorize Pell Grant increases. The federal government spent $67 billion on grants and tax credits in 2014 (King also includes loans, but their cost is more complicated to estimate). King told the senators to just take $10 billion out of the direct aid program and use that money to create a matching program for states—states that fund their public institutions at high levels get a reward in federal dollars, and lose their match if they go below a certain amount. But the idea of bolstering public higher education without raising federal taxes is appealing, and as Democrats continue down the path toward debt-free college, they will find King Alexander showing them the way forward, intent on undoing the mistakes of the past. This may not be the direction policy is moving, of course. The deregulation of college finances have been going on for more than 20 years and even now the reform proposals of many Republican presidential candidates suggest that the solution could come by making colleges pay back loans if their students default or through a bizarre plan in which students would pledge to return a share of their future earnings to financiers who “invest” in the college educations. But if it hasn’t worked for 20 years maybe it’s time to consider something else. King just might have the best idea. Let’s watch him to see how far this goes.